"Not above you, not beneath you, but with you!" Meet us on Facebook and be sure to us ! It's time for our first Major Fundraising Event of the new Lions year! Candy Order! 20% of all candy orders are donated to the Lions Club! 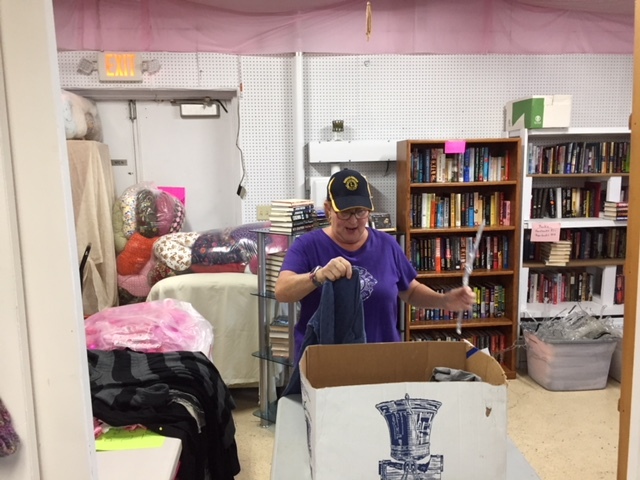 Click here: https://mechanicsburg-lions-club.terrilynncares.com/ Order anything listed. All items will be shipped directly to you or anyone you designate anywhere in the U.S. 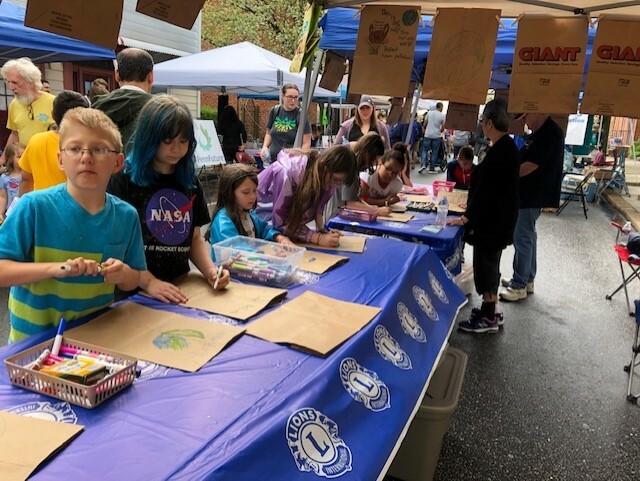 The Mechanicsburg Lions continue supporting Earth Day Downtown Mechanicsburg by operating a large event table targeting kids. The Lions secure paper grocery bags from Giant and Weis. 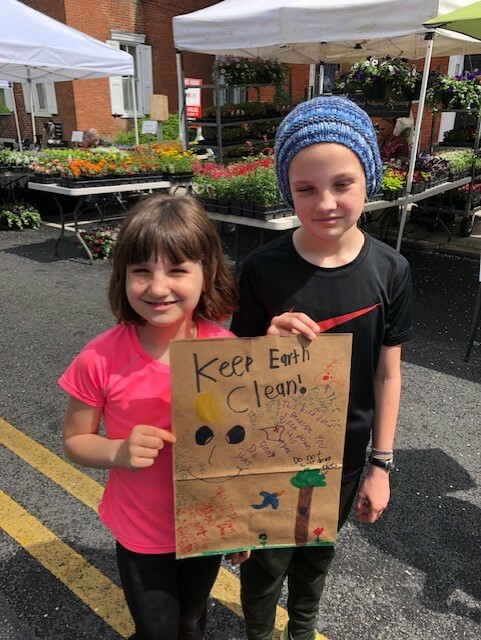 Those stopping by the display are encouraged to draw Earth Day focused pictures and write Earth Day messages on the bags. The bags are temporarily displayed at the event and then collected and returned to the grocery stores. 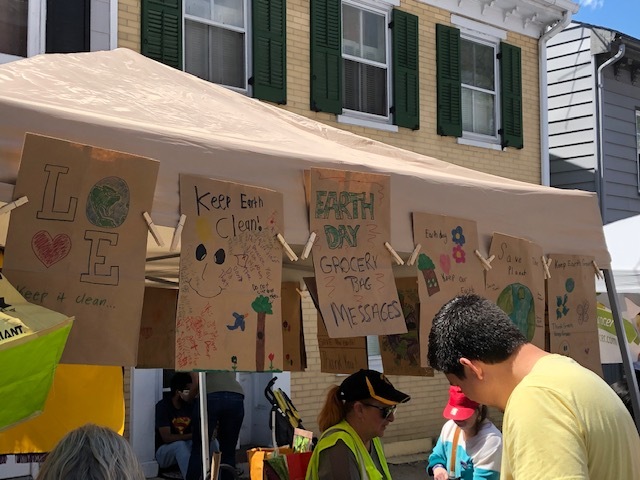 Customers who get their groceries in paper bags get a surprise Earth Day message! 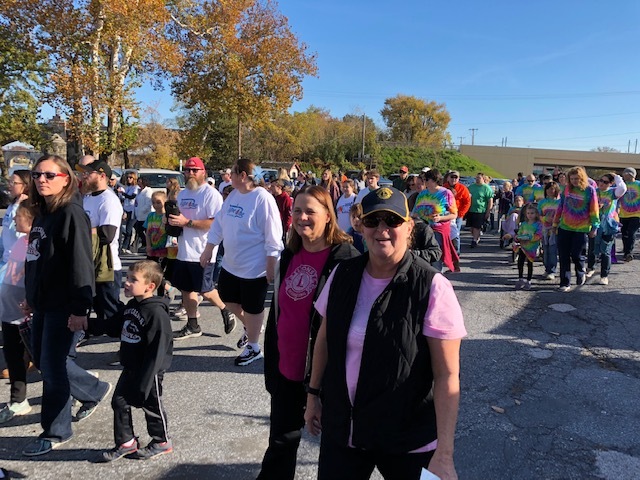 9 Mechanicsburg Lions Club members participated in this FUN event were: Lions Chris and Cathy, Jim and Sue, CeCe, Bob, Tawyna, Bill and Shirley. 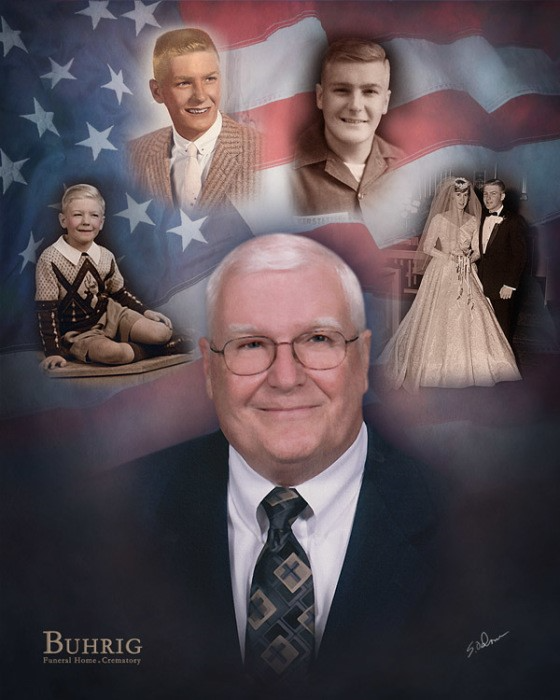 "Lion Tom Kerstetter was a Mechanicsburg Lion for almost 9 years. He was very active at the beginning of his time in the club & was elected to the post of 2nd Vice President. He planned to be our King Lion, but due to health reasons, he had to back out. Lion Tom can be credited with starting our first Club Website and managing it for a few years. Thanks for your service to our country and to Lions. Rest in Peace Lion Tom." 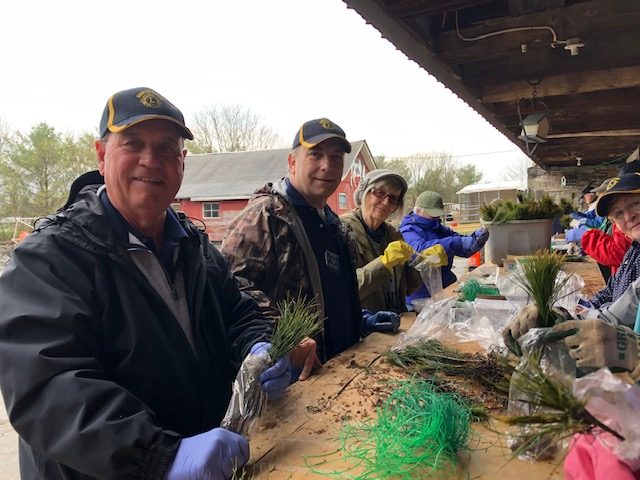 The Mechanicsburg Lions club had 6 members participate in the annual wrapping of seedlings project that supports Earth Day week. 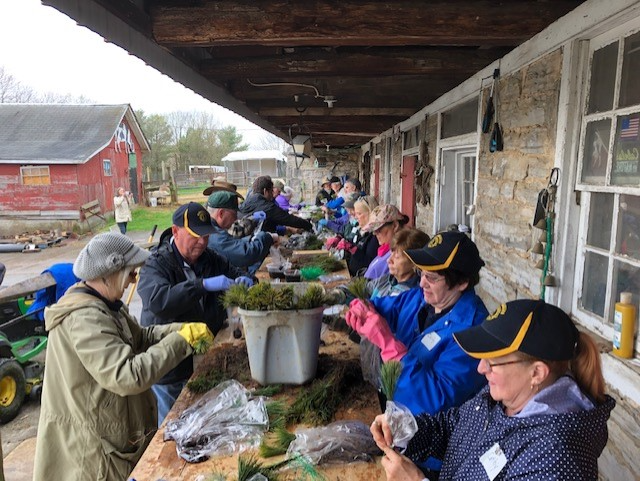 This Environmental project, that the Lions Club has supported for several years, wraps 5000 seedlings for distribution to elementary schools. Participating this year from the club were Lions: CeCe, Dona, Jim and Sue, and Chris and Cathy. 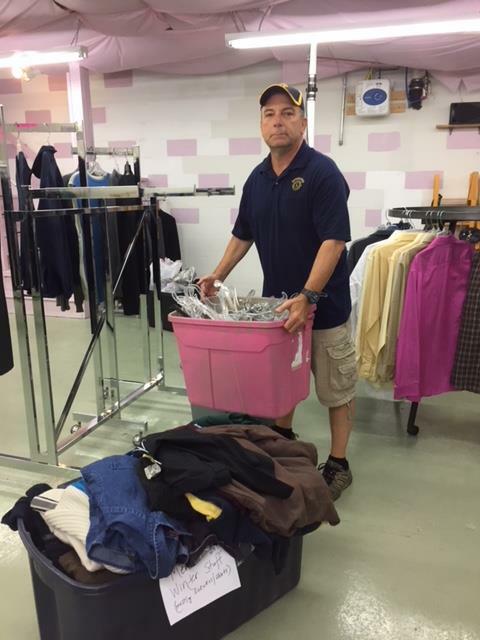 Three Lion volunteers assisted “Pink Hands of Hope” with their annual inventory changeover. 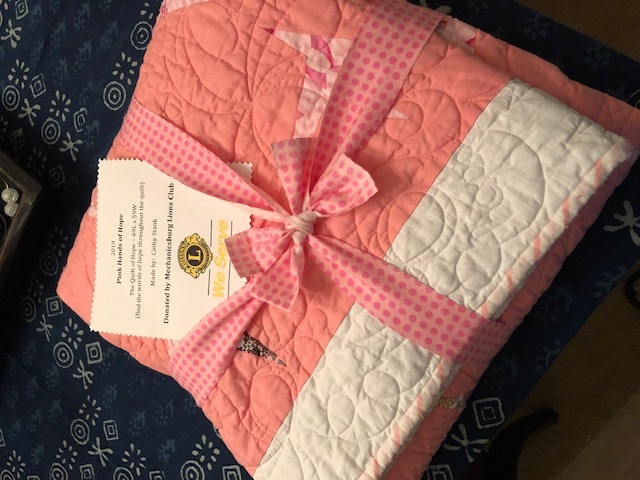 In addition, a quilt made by Lion Cathy, was donated for their fund raising auction. The participating Lions were Lion CeCe, Lion Dona, and Lion Cathy. 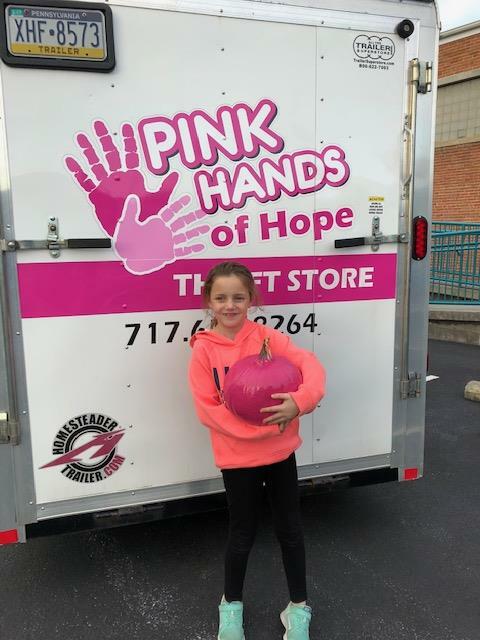 ‘Pink Hands of Hope” is an organization that assists women who are “in the fight” against cancer. 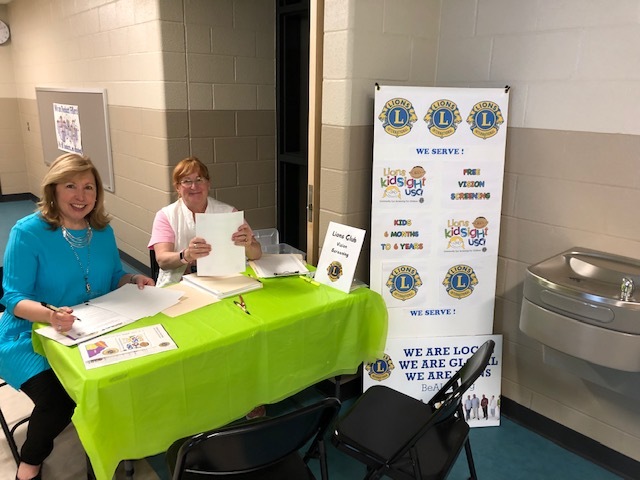 For the 3rd year in a row, the Mechanicsburg Lions Club provided free vision screenings for the children who were registering for kindergarten at the Mechanicsburg School District’s Kindergarten Academy. The screening covered 3 days of registration April 8 - April 10. This important community service event, focused on our VISION category, was led by Lion Jim Miller. Working the Eye screenings were the following: Lion Leroy, Lion CeCe, Lion Erica, Lion Becky, Lion Terry, Lion Dianne, Lion Jim, Lion Sue, Lion Bill, Lion Steve, Lion Cathy and Lion Chris. The Lions completed vision screenings on 264 children. 34 of those scanned were referred for follow up eye care. The Lions also completed vision screenings on 11 adults at this event. 4 of the adults were referred for follow up eye care. 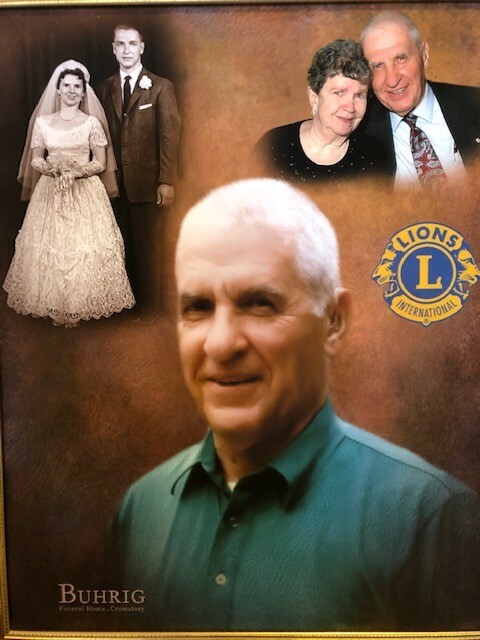 Raymond “Ray” Charles Rosnick, age 87, of Mechanicsburg, PA and a Proud Lion with 54 years of Service to the community, passed away suddenly March 11, 2019. 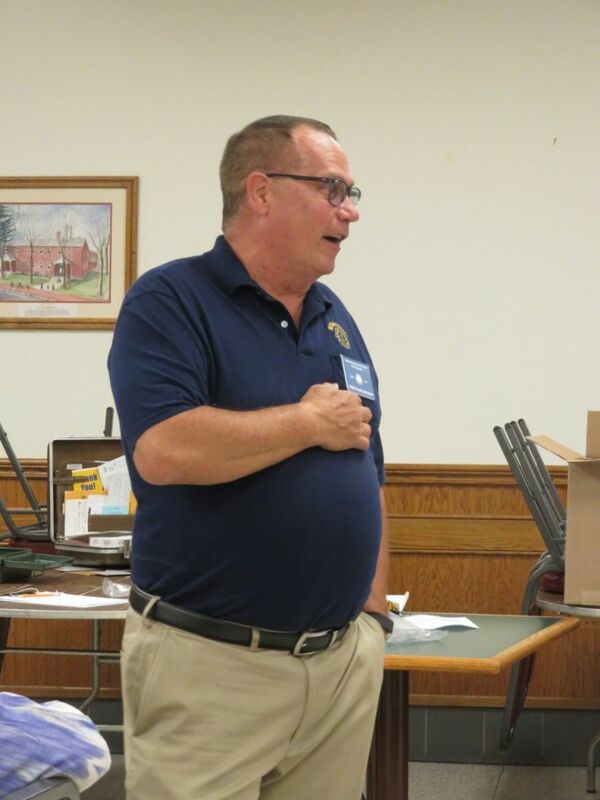 Ray’s service included multiple terms as Mechanicsburg Lions Club President and over 35 years as Club Secretary. Lion Ray was the recipient of many awards including the rarely awarded Progressive Melvin Jones Fellowship and he was one of only six people in Pennsylvania to receive the John R. Crone Fellowship. 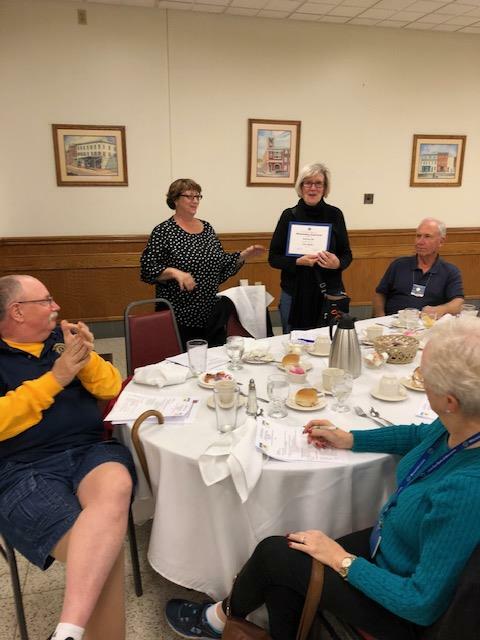 Lion Ray has also been recognized for his laudable 24 years of service as a board member of the Lions Hearing Research Foundation with 21 of those years spent serving as the board’s secretary. 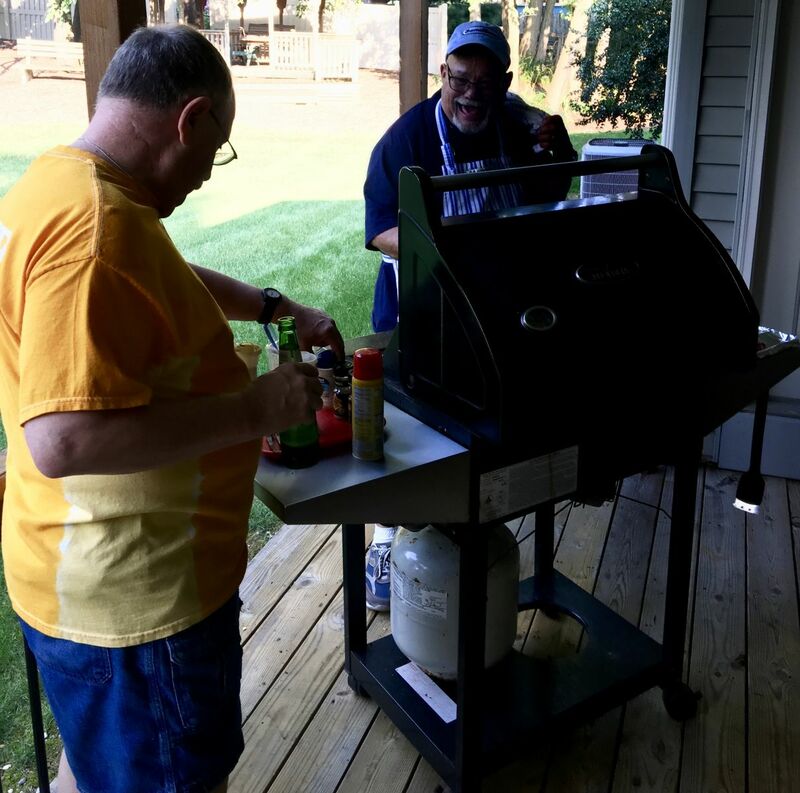 Lion Ray truly exemplified the mission of Lionism which is, “Lions serve…to improve their communities, and the world.” Our Lions Club, the community and the world are certainly better places because of Lion Ray. Past District Governor Dennis Cope presents the John R. Crone Fellowship Award to Lion Ray Rosnick in honor of his 24 years of service on the board of the Hearing Research Foundation. 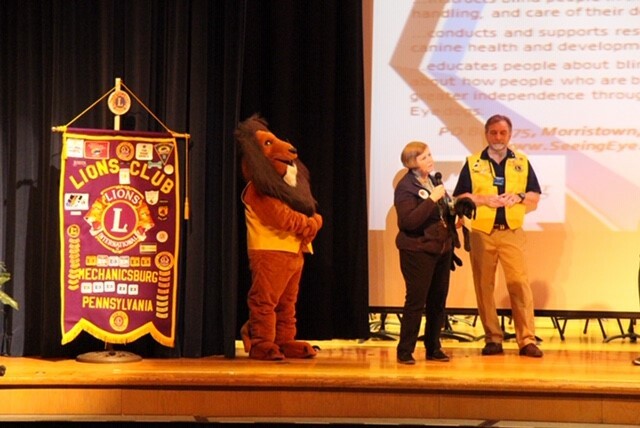 On Thursday, Feb 28, members of the Mechanicsburg Lions Club participated in the Elmwood Academy school assembly where the “Give from the Heart” program was celebrated. 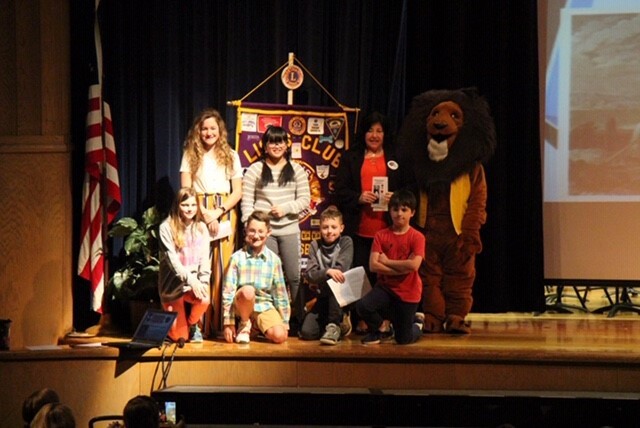 This is the 4th year that the Mechanicsburg Lions club has sponsored this program for the 5th grade classes in the Mechanicsburg School district. This year, 14 5th grade classes researched, made presentations that were posted on WEB sites they designed, and ultimately voted on 2 organizations to receive the $500 award. 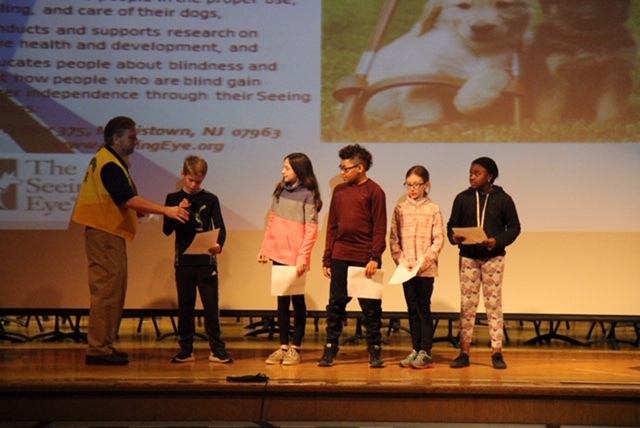 This year, the recipients were “seeing Eye” and “Pa. Wounded Warriors “. 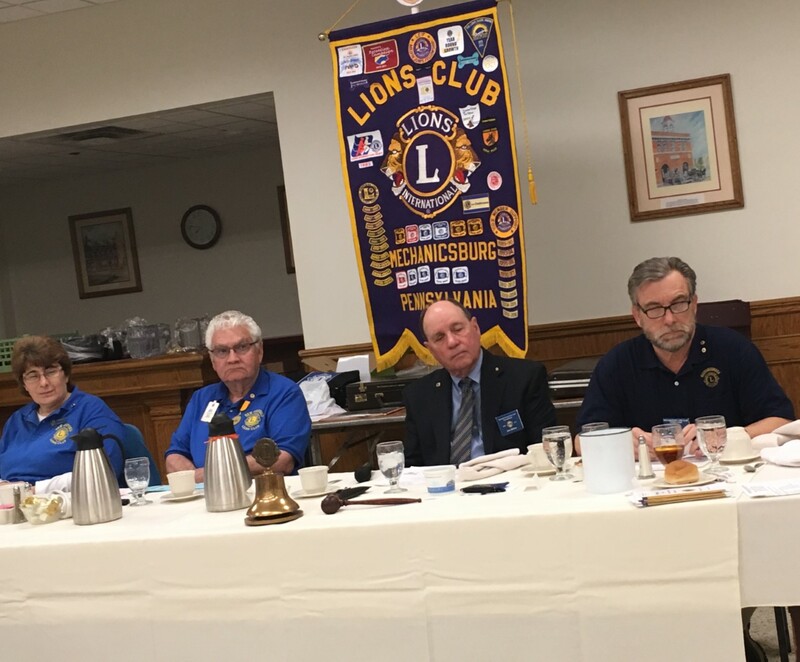 Participating in the event for the Mechanicsburg Lions were Lions Ted Cramer, Wayne DeFonzo, Cathy Stank (Foss the Lion), John Behel (photography), and Chris Stank. 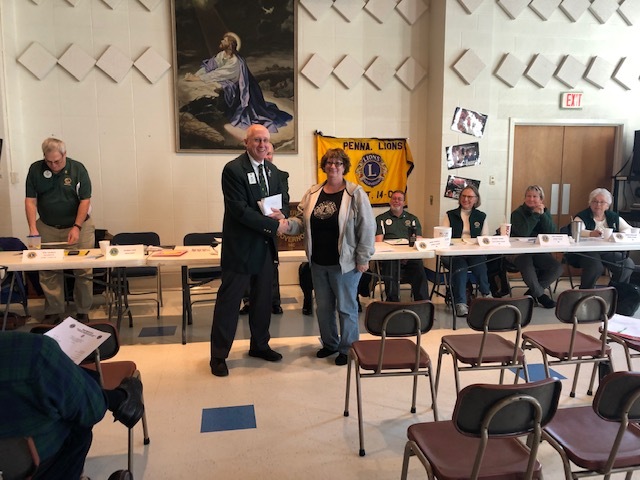 At the Feb 16 Lions District 14C Cabinet meeting, the Mechanicsburg Lions Club received 2 awards. The first award was the “Club Excellence Award” for fiscal year 2017-2018. This is for outstanding achievement in areas of Service, Membership growth and development. The second award was the District Governor’s “Plus One” award for achieving an increase in net club membership. President Linda Fenicle accepted the awards on behalf of the club. 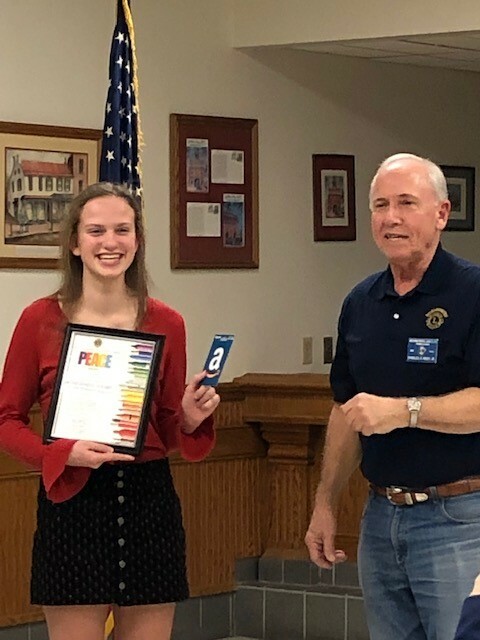 At the Feb 16 District Cabinet meeting, the Mechanicsburg Lions Club’s “Peace Poster” winner, Lauren Mark, was recognized for finishing 2nd place in the District 14C competition. Lauren was joined with her parents and grandparents for the presentation. 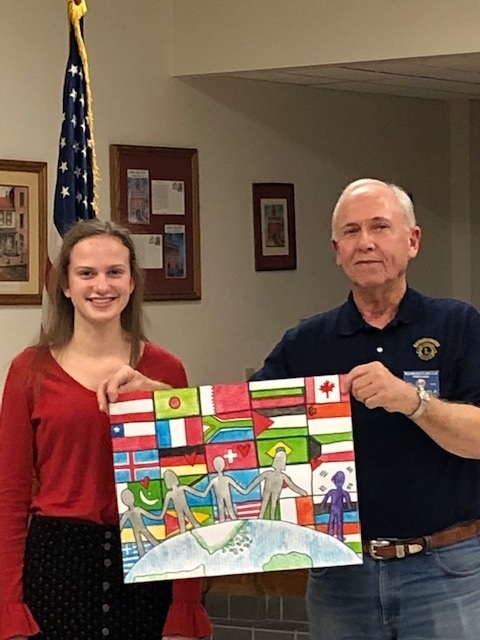 The Mechanicsburg Lions Club Peace Poster winner, Lauren Marks, visited the club recently along with her parents and teacher Mrs Pastuka. Lauren’s poster finished 2nd in the district. In addition to recognition from the club, Lauren has been invited to attend the next District meeting. The clubs Peace Poster program is led by Lion Charlie Rixey. 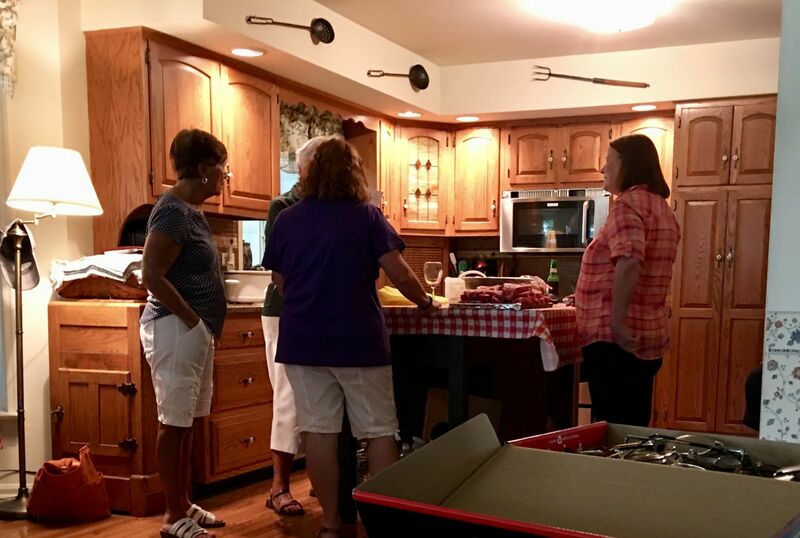 The Mechanicsburg Lions Club recently made a donation to Pink Hands of Hope. 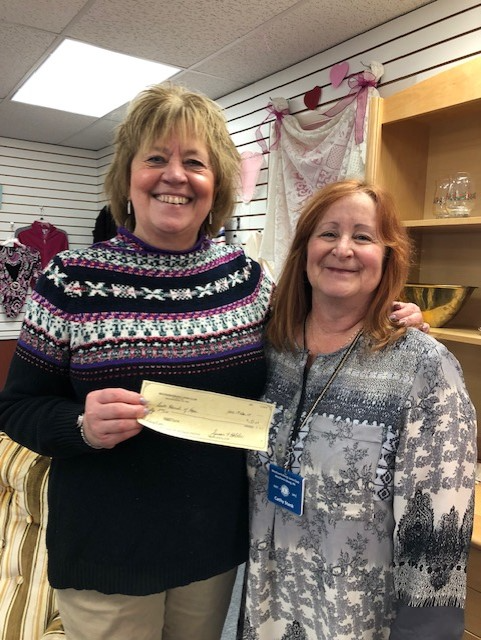 This donation was funded by a gift basket auction conducted at the Clubs Christmas party. The basket was put together by Lions Diane Hartzell and Cathy Stank. The winning bid, which was donated, was made by Lion John Beihl. 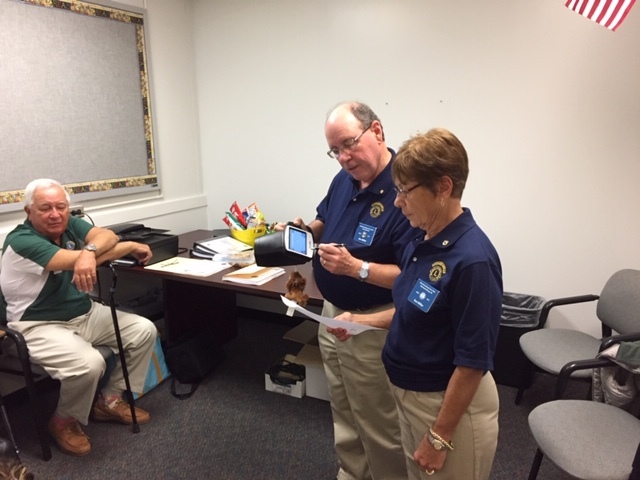 The Mechanicsburg Lions Club is actively servicing the community with Vision Screening programs. The club estimates that they will scan their 1000th child in 2019. 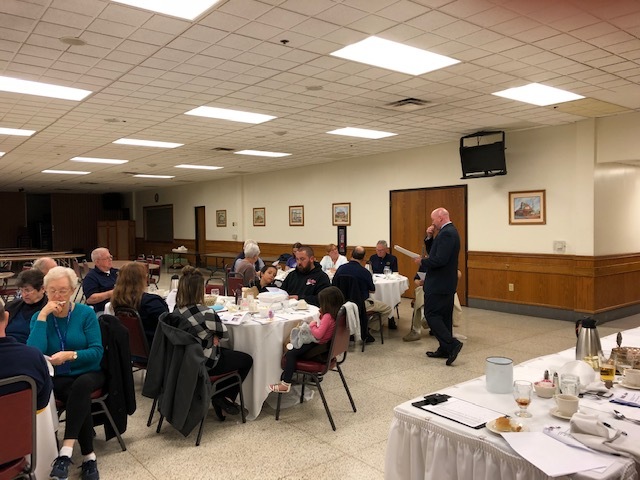 After performing a scanning program at the Mechanicsburg School Districts “Literacy under the Lights” program, the club received some inspirational feedback from the Teacher who was in charge of the program. The story is that one of their schools families was screened and it was recommended that their little girl see an eye doctor. The family was not sure where to go, so they contacted the school nurse. The child was then seen by a pediatrician who recommended an eye screening and helped get the family into Hershey. Hershey then referred the child to Children’s Hospital of Philadelphia and it was there that the little girl had surgery to correct her eye. The teacher said she believed there was a reattachment performed. The teacher noted it was through the initial Lions Club screening that the parents were made aware of any problems. Standing left to right are: Lions Jim Miller, Chris Stank (Foss the Lion), Leroy Weaver, Bill Dixon, Shirley Dixon, Cathy Stank. Seated left to right: Lions Diane Hartzell, Terry Hartzell, and Sue Miller. 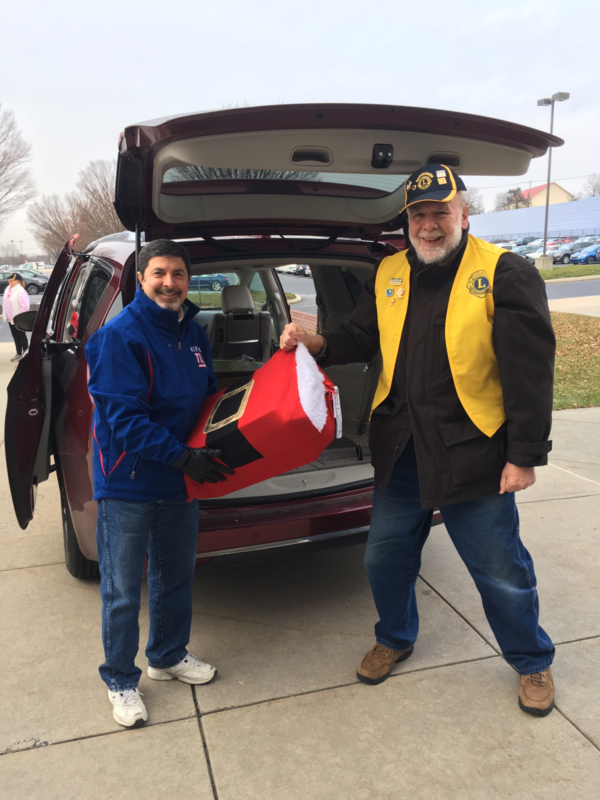 The Mechanicsburg Lions played Santa this morning, delivering gifts for the Cumberland Valley School District's Angel Tree program. We brought 6 vehicles to CV ...High and delivered the gifts to 5 different schools for hundreds of deserving kids! 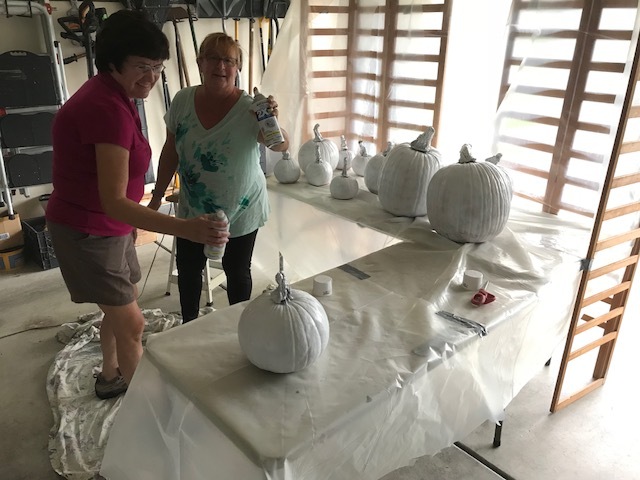 Lions participating were: Tim & Lana McCaulley, Jim & Sue Miller, Chris & Cathy Stank, Bill & Shirley Dixon, Wayne DeFonzo, Terry & Diane Hartzell & Ted Cramer. This was our 3rd year of delivering gifts! Lion CeCe receives 5 year certificate. 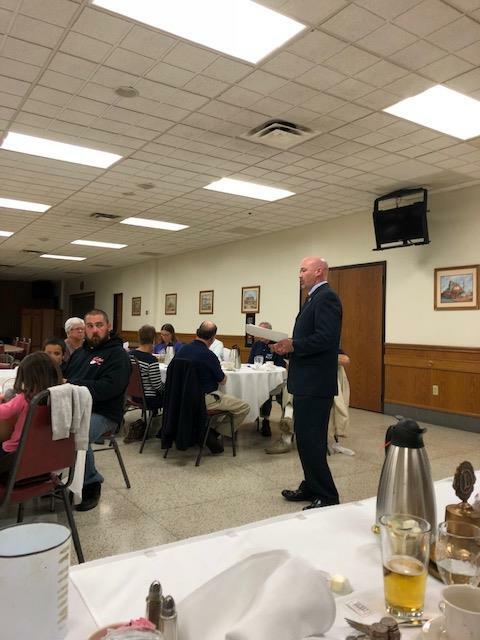 Dr. Mark Leidy, Mechanicsburg Superintendent of schools was our clubs guest speaker recently. Dr. Leidy’s presentation was very informative and gave our members some excellent service opportunities. 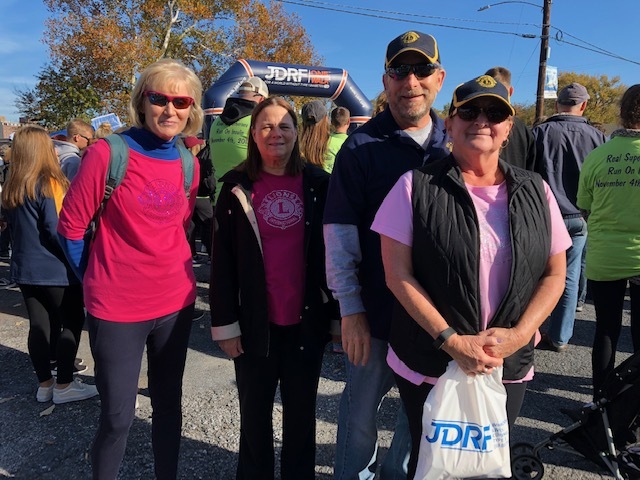 Members of the Mechanicsburg Lions Club participated in the JDRF “One Walk” on Sunday, November 4. 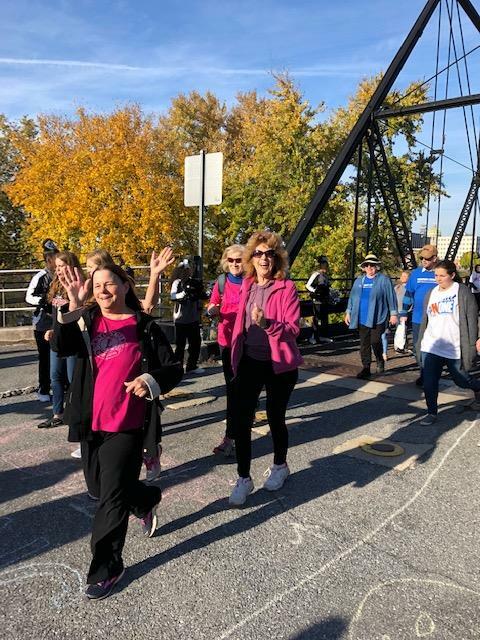 The walk started on City Island, continued on Front street and returned to the island for the finish. 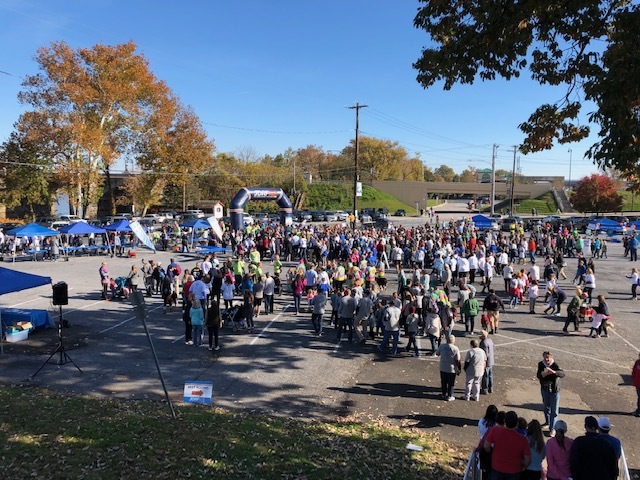 Our Clubs Team, as well as a Lions District team, participated in the walk to help end Type 1 diabetes (T1D). The event was a fun and inspirational time! Thanks to Lion Erica Meloy for taking the lead and organizing our clubs first participation in this important event. 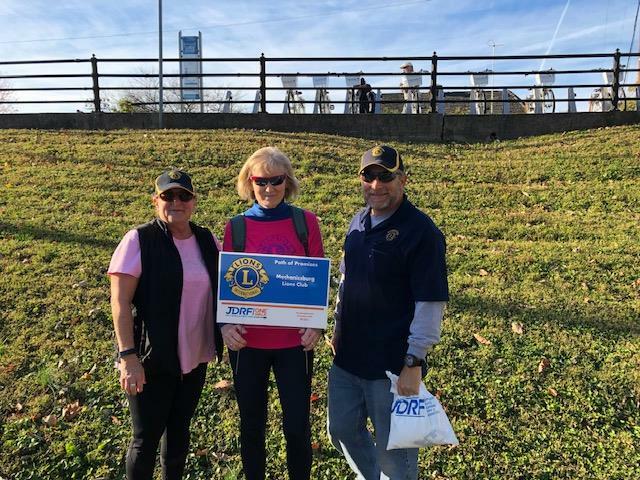 Club members who walked the “One Walk” were: Lions Erica Meloy, Cathy and Chris Stank, and Susan Holder. Several club members raised money to support the event. 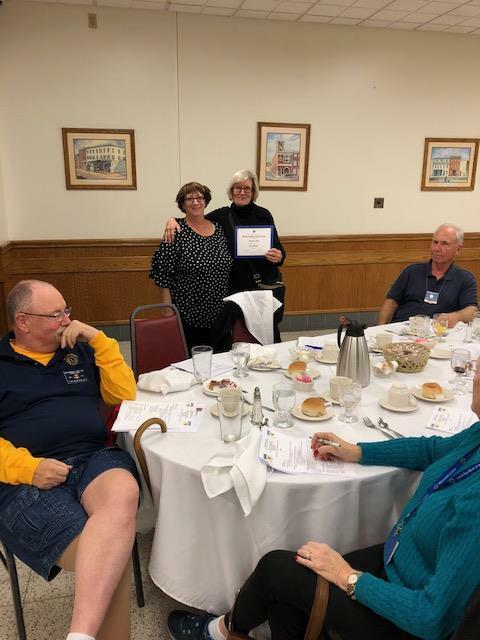 Those funds raised, added to the the Mechanicsburg Lions Clubs budgeted Diabetes support, equated to a donation of $600. With Type 1 Diabetes, there are no days off and there is no cure. But there is hope! 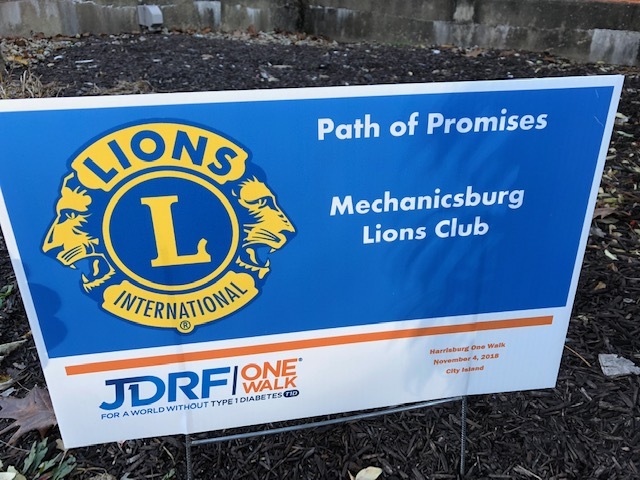 The Mechanicsburg Lions are proud to support the cause! 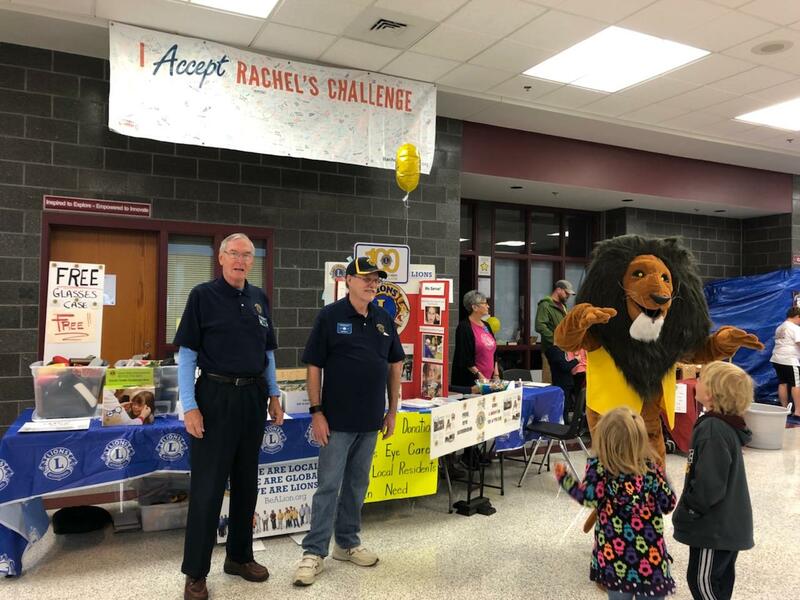 Congrats & thanks to the Nine members of the Mechanicsburg Lions Club who participated in the Mechanicsburg Wildcat Foundation Community Day on Saturday, Nov 3. 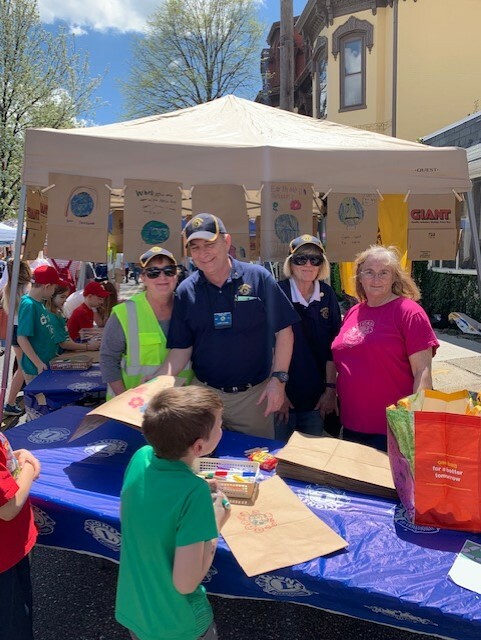 The club members gave away free glasses/sunglasses cases, promoted “Lionism “ to the Community Day attendees, and provided FREE vision screenings. 64 vision screenings were performed, with 7 individuals being referred for vision care by an eye doctor. 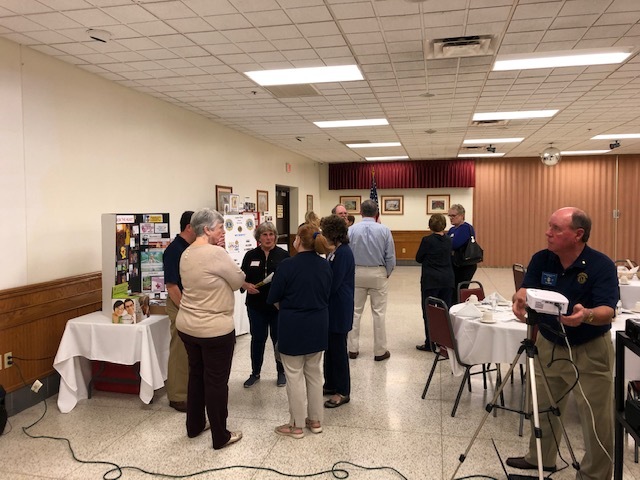 Participating for the club were Lions: Jim and Sue Miller, Bill and Shirley Dixon, Donna Bernardi, Susan Holder, Leroy Weaver, John Behel, and Chris Stank. A special visit by “Foss the Lion” was also part of this important service project. 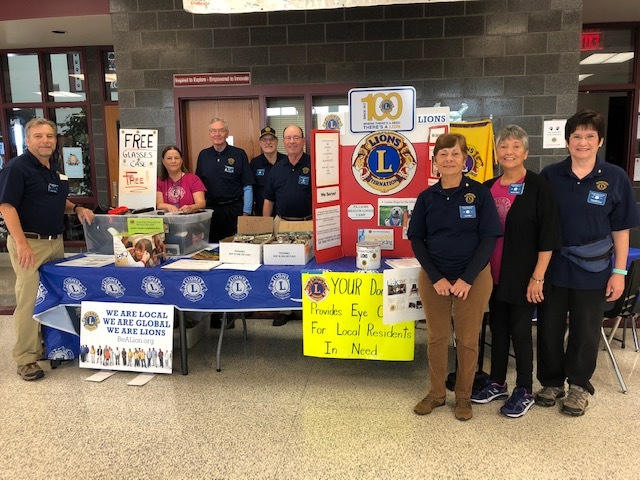 Nine members of the Mechanicsburg Lions Club participated in the Mechanicsburg Wildcat Foundation Community Day on Saturday, Nov 3. 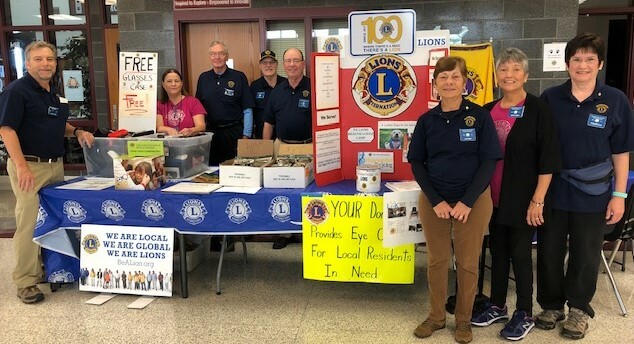 The club members gave away free glasses/sunglasses cases, promoted “Lionism “ to the Community Day attendees, and provided FREE vision screenings. 40 vision screenings were performed, with 4 individuals being referred for vision care by an eye doctor. 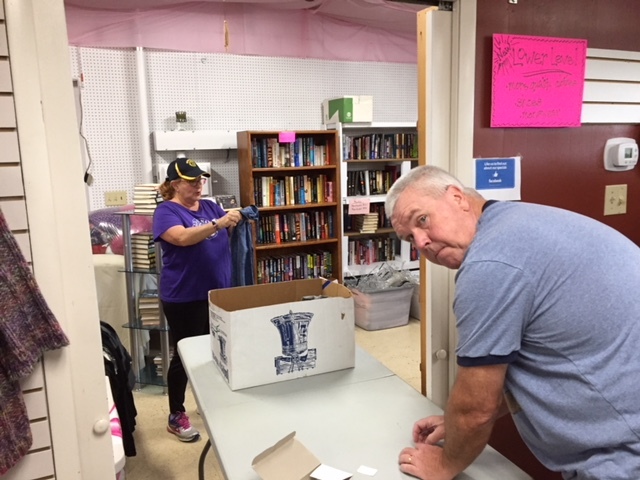 Participating for the club were Lions: Jim and Sue Miller, Bill and Shirley Dixon, Donna Bernardi, Susan Holder, Leroy Weaver, John Behel, and Chris Stank. A special visit by “Foss the Lion” was also part of this important service project. We had 16 Lions show up today to help with the Streets of Treats/White Cane Day! Thanks to Lion Bob Buhrig for setting up the canopy, tables & chairs for us! Thanks also to Lion John Behel for Chairing this event & Lion Susan Holder for collecting all of the candy & delivering it this morning. Thanks for helping Lions: John Behel, Ron Cashman, Susan Holder, Jim Miller, Sue Miller, Tim McCaulley, Lana McCaulley, Leroy Weaver, Dona Bernardi, Ted Cramer, Carol Geesey, John Geesey, Bob Buhrig, Mike Fenicle, Linda Fenicle, & Cece Viti. We had hundreds of kids show up in their Halloween best and were excited to choose from a wide variety of candy that was purchased by many members of our club. Since it was also White Cane Day, many parents donated to our cause. 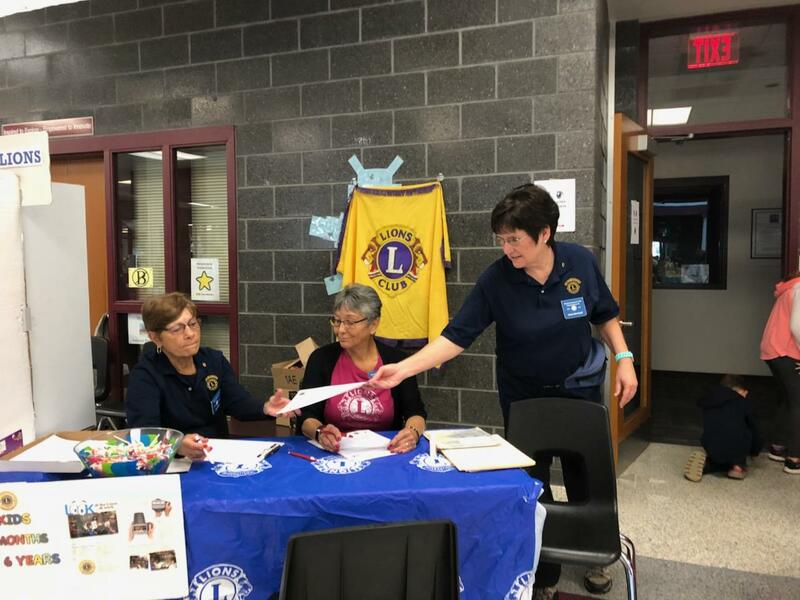 The Mechanicsburg Lions Club provided FREE vision screening on Friday, October 19th, at the Simpson Public Library PreSchool activity day in Mechanicsburg. Six Lions completed 64 screenings. 10 of those screened were under age six. Seven of the 20 screening subjects were referred for follow up eye care. Participating Lions included Jim and Sue Miller, Terry Hartzell, Bill and Shirley Dixon, and Chris Stank. 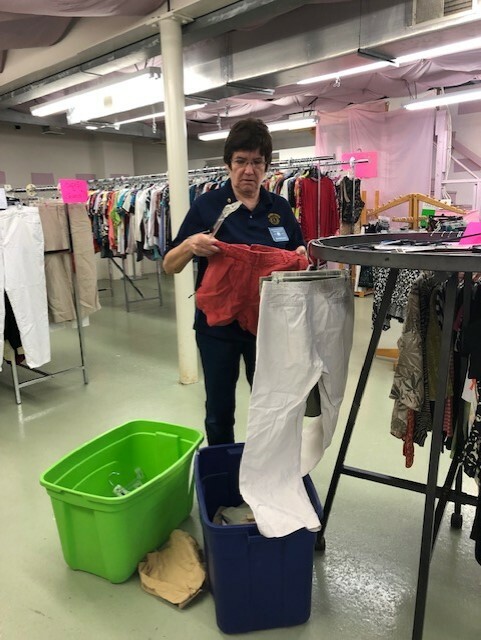 Members of the Mechanicsburg Lions Club recently volunteered time to assist “PINK HANDS OF HOPE” 5th annual fashion show. The event is a celebration for those in the fight and for those who have beaten breast cancer. 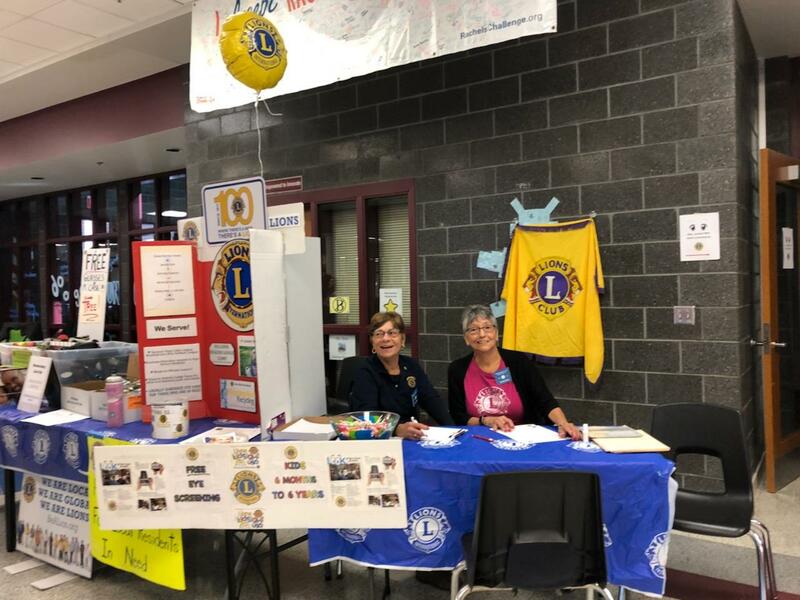 Lions Donna Bernardi, Cathy Stank and Cece Viti volunteered on behalf of the Lions Club. Thanks for your Service Lions! Thanks to Lions Cece Viti & Chris Stank for joining me today at Boscov's for our fundraising event. Also pictured are Melanie Pepperman who brought Seeing Eye Puppy in Training, Legend to help out. Legend is 11 months old and will begin his next phase of intensive training in February. We had a good day today, interacting with lots of people and collecting lots of donations. Lion Chris will tell us the exact totals later. 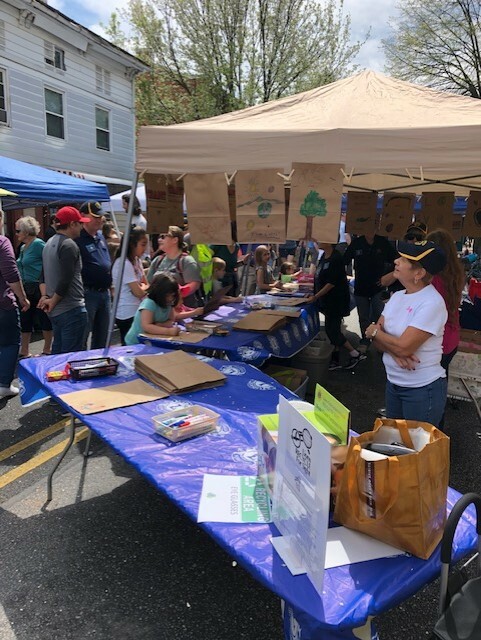 Thanks to all of the Lions who helped with this event - I know that Lions Diane Hartzell & Wayne DeFonzo helped out yesterday-There may be a couple more - Lion Chris will let us know about that too! 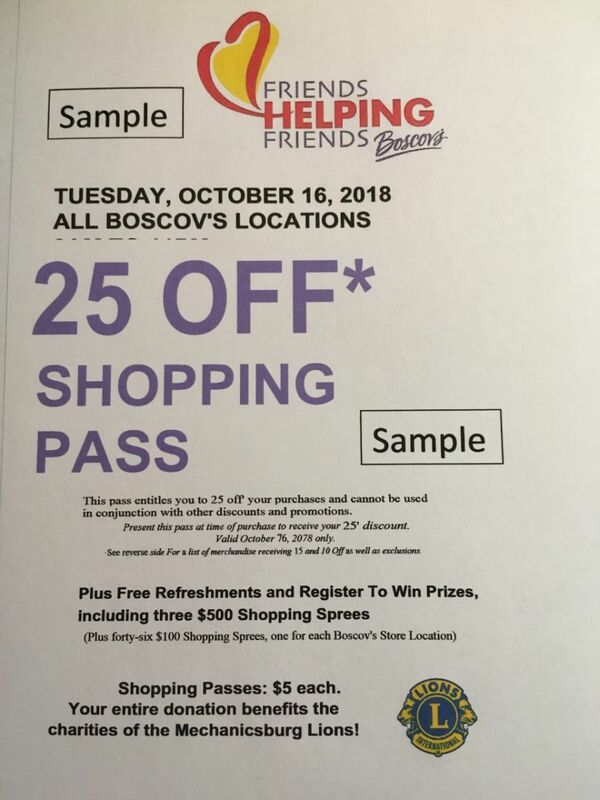 The 25% shopping spree Main Event is on Tuesday. We will have Lions there all morning. Lion Tawnya Kling organized our participation in Mechanicsburg’s Halloween Parade! 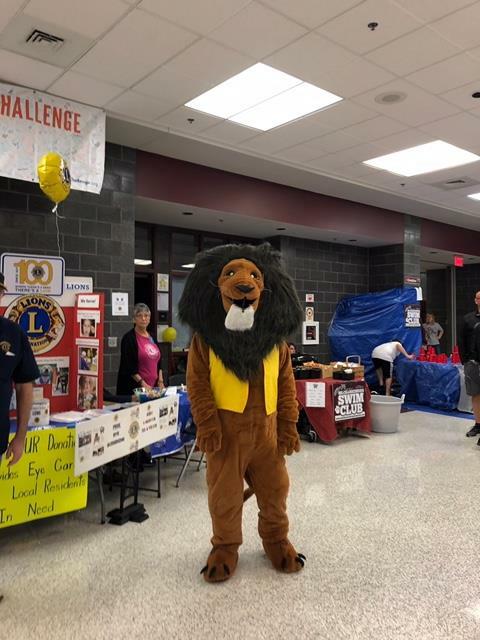 Foss the Lion was there along with Lions Tawnya Kling, Cece Viti, Diane Hartzell & Terry Hartzell. Nice work Lions! Mechanicsburg Halloween parade was a blast. Thanks to Lion Bob Dipple's daughter, Becky Dipple and Lion Tawnya's great friends and neighbors Pat Ruth, Stephanie Ruth, and their kids Adam and McKensie. Pat got us the golf cart to carry Foss the Lion. The event is a celebration for those in the fight and for those who have beaten breast cancer. Lions Donna, Cathy and Cece volunteered on behalf of the Lions Club. 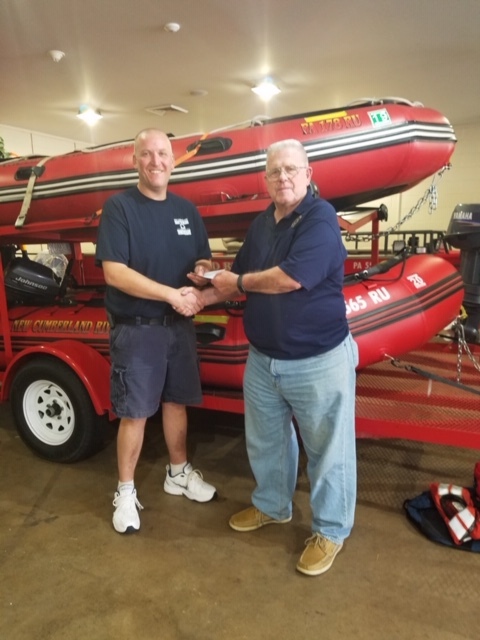 The Mechanicsburg Lions Club made a donation to the New Cumberland River Rescue to help them cover expenses from deployment to recent hurricane Florence hit areas. Lion Leroy Weaver led this donation project and is pictured presenting the donation. 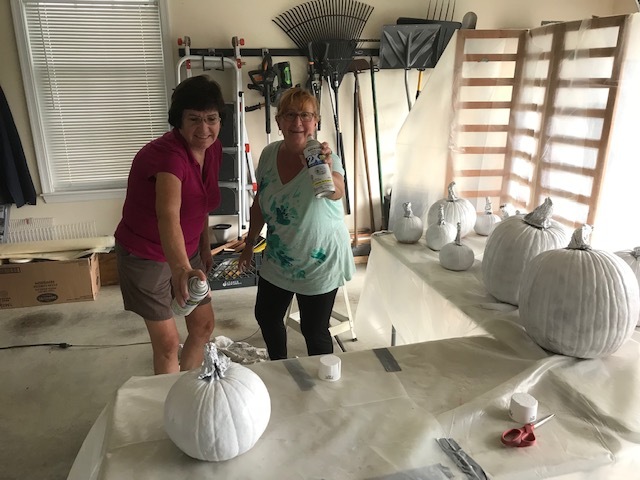 Lions Donna and Cathy volunteered their artistic talents to help Pink Hands of Hope prepare for their annual fashion show and fund raising event. 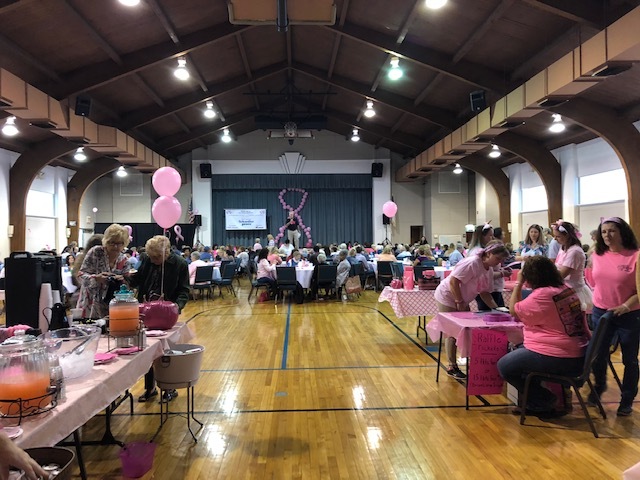 The program is to raise money to support women fighting cancer. 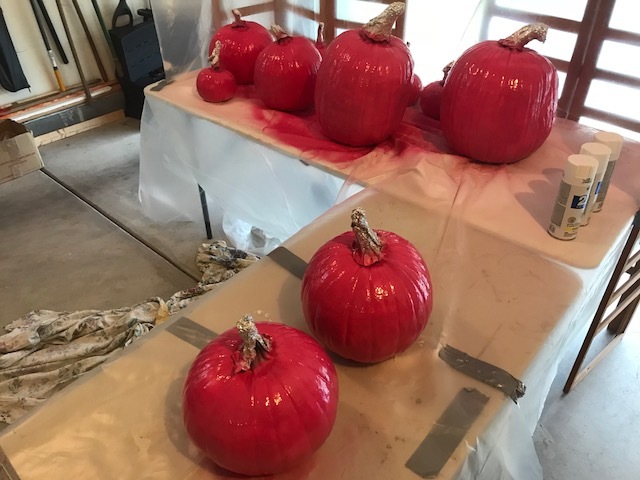 Lions Donna and Cathy’s pink pumpkins will be used to decorate the event. 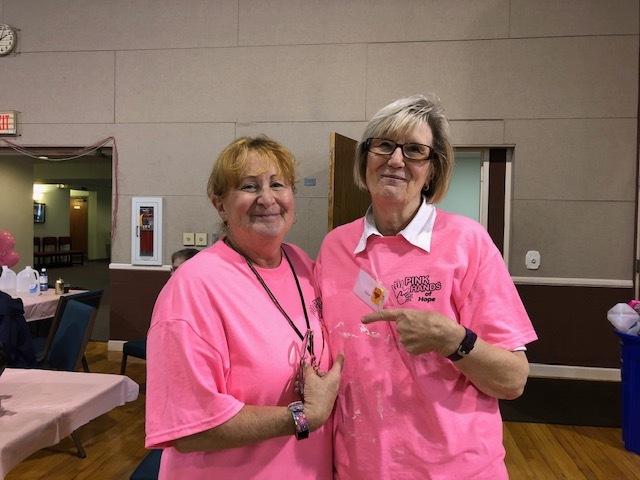 Two Mechanicsburg Lion’s volunteers assisted “Pink Hands of Hope” on Saturday, Sept 15. The work helped this charity to prepare for clothing sales to raise money to support women who are fighting cancer. Lions Chris and Cathy were the volunteers. 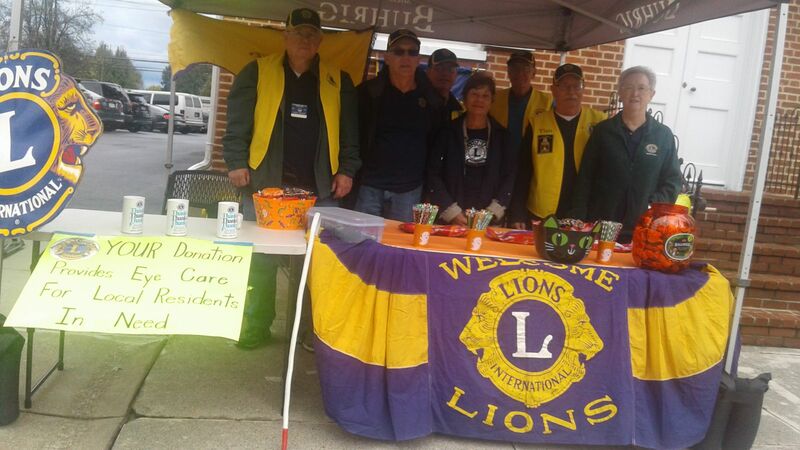 Seven Mechanicsburg Lions volunteered time to assist in the Mechanicsburg Community Days event on Saturday, Aug 11. 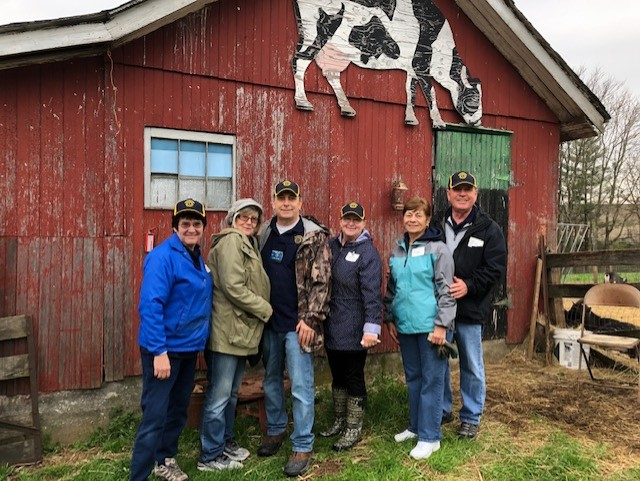 Participating were Lions Jim and Sue Miller, CeCe Viti, Karl Heimbech, John and Carol Gessey, and Chris Stank. The club received mention and note of appreciation in the opening ceremony. 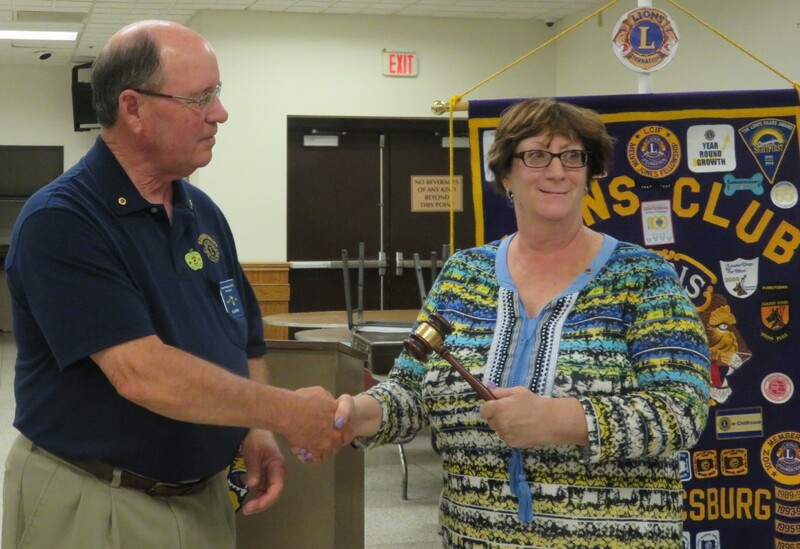 Congratulations to Lion Linda Fenicle for being elected & installed as our new Club President. Immediate Past President Jim Miller passes the gavel to signify the transfer of office. We are all looking forward to another great Lions Year! Congrats to Lion Leroy Weaver for receiving the coveted Melvin Jones Fellowship last night! He has served as our King Lion, received perfect attendance awards for many years & is unselfishly donated his time at all of our functions. He certainly earned it! The Award was presented by PCC Terry Hartzell and the pin was placed by Lion Lana McCaulley, the daughter of the late Lion Foss Cramer who was Lion Leroy's sponsor. Congratulations to our newest Lions who were Inducted tonight: Lions Carol & John Geesey and Lions Shirley & Bill Dixon. Thanks to all who were able to attend. Our next meeting will be on July 17th. Watch for the July newsletter for more details! 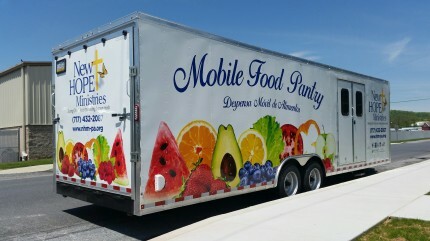 New Hope Ministries, Meals on Wheels, and the Joseph T. Simpson Public Library. 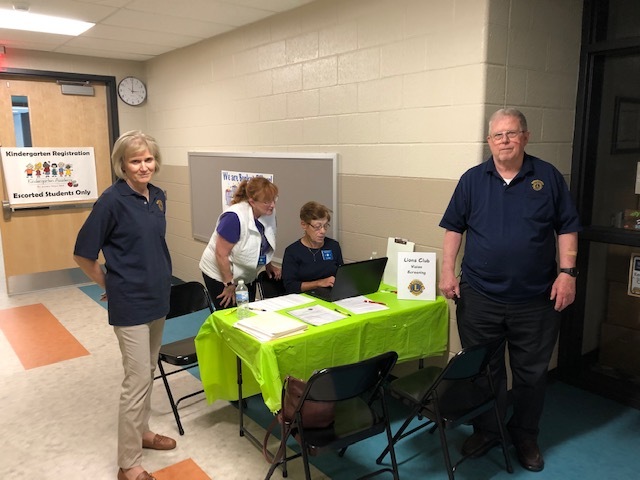 Nine Mechanicsburg Lions Club members participated in the Mechanicsburg School District's Literacy Under the Stars event. The Lions offered FREE vision screenings to children attending the program. 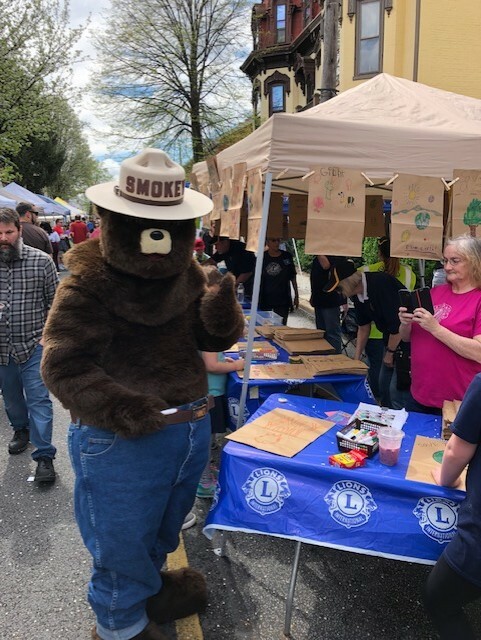 "Foss" the Lion had some fun assisting The Lions Club members at this fun community SERVICE event! 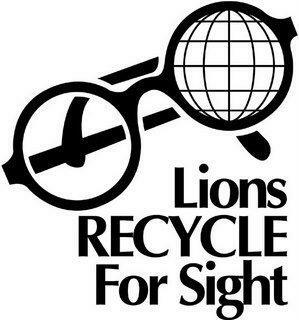 Lions who worked the Vision Screening were: Jim and Sue Miller, Cathy and Chris Stank, Terry and Dianne Hartzell, Bill and Shirley Dixon, and Leroy Weaver. Past District Governor Fred Lamason performs the installation ceremony for our newest Lion, Dona Bernardi. Lion Cathy Stank looks on as Lion Dona's sponsor. Congrats! A BRIGHT START IN LITERACY EDUCATION FOR PARENTS AND THEIR CHILDREN, BIRTH THROUGH AGE 5. 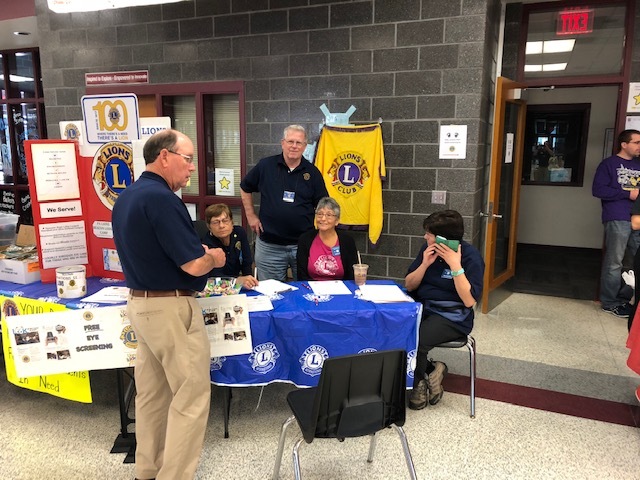 The Mechanicsburg Lions Club Vision Screening Team recently participated in the Mechanicsburg Kindergarten Academy's 3 day registration program. The Lions screened a total of 208 children who were registering for next year's kindergarten class. 20 children were referred to eye doctors for follow up care. In addition, the Lions screened 40 brothers and sisters. 8 of those scanned needed medical follow up. 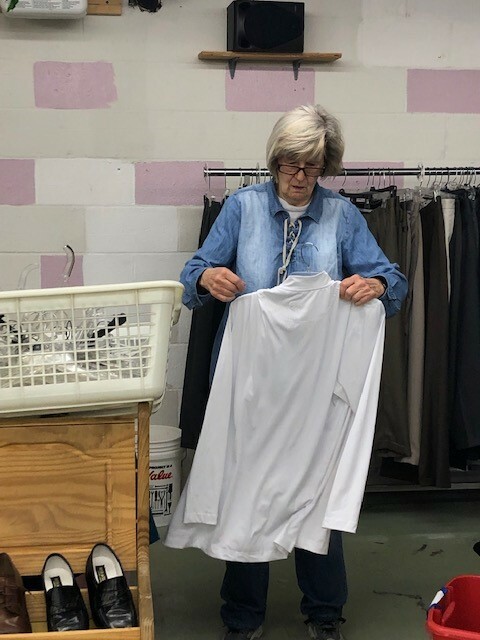 Thanks to the following Lions for working this valuable community service: Lions Jim Miller, Sue Miller, Susan Holder, CeCe Viti, Leroy Weaver, Cathy Stank and Chris Stank. 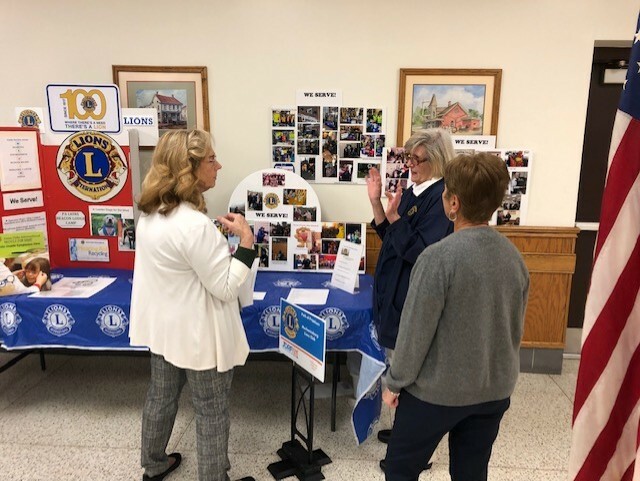 The Mechanicsburg Lions Club's "Give from the Heart" program was run at Upper Allen Elementary School for the 3rd year. The 6 fifth grade classes were each given $100 to donate to a charity of their choice. They teamed up and put together presentations that were then voted on by the class. This year's recipients were: The Humane Society, the Cancer Research Institute, Dicks sporting Good Foundation, Pa. Wounded Warriors, World Wildlife Fund, and the American Cancer Society. The student groups got the opportunity to hand the check to a representative of the group they chose at a special "Town Hall" meeting at the school on Feb 28. Members of the club who participated in the town hall were: Lions Lana, Wayne, Cathy, Susan,John, and Chris. 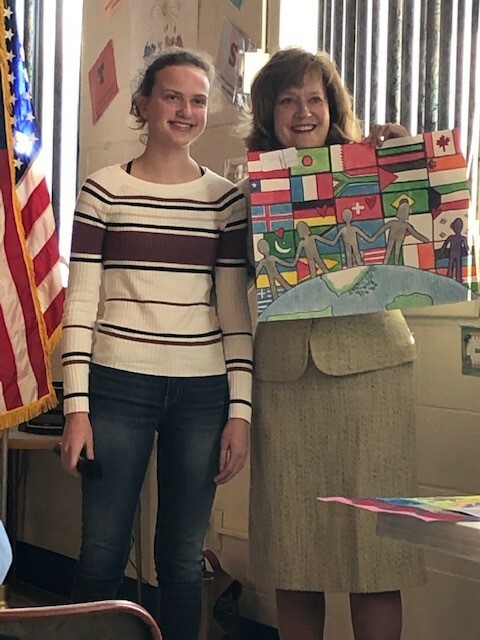 Chang Wang, a student at Mechanicsburg Middle School, is recorgnized for her winning entry in Lions International's Peace Poster Contest. her award from District Peace Poster Chair Lion Patti Hullmann and a special award from State Council Chair Larry Edwards for receiving an "Honorable Mention" at the state level. Our membership was proud to sponsor Chang! King Lion Jim Miller, Art teacher Sharon Pastucka, Chang Wang, Scott Meldrum & Chang's mother, Lion Charlie Rixey, Peace Poster Chairman. 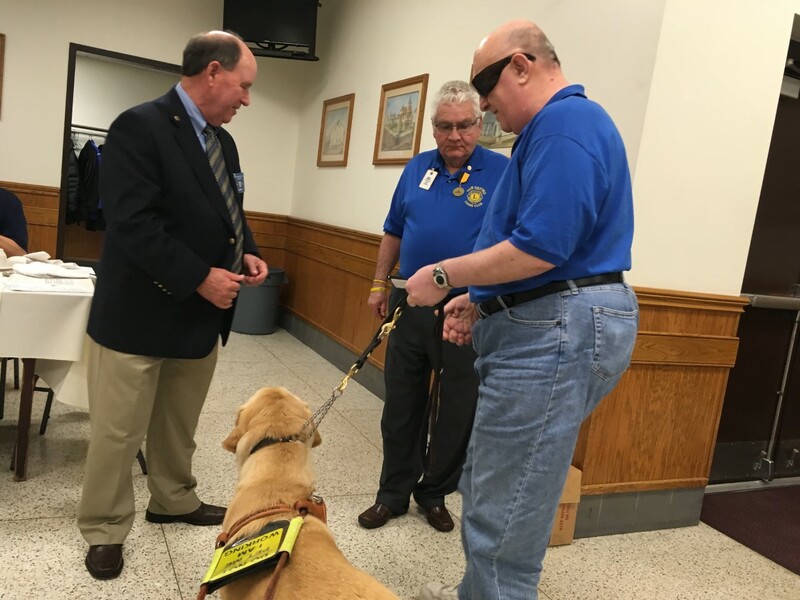 Mechanicsburg police officer Shutt and his partner "Marc" visited the Clubs meeting. "The 12 Pains of Christmas"! The Mechanicsburg Lions got to play Santa on Tuesday Dec. 12th! The faculty & staff of the Cumberland Valley School District collected gifts for their Angel Tree project & the Lions delivered over 200 gifts to 5 schools. Thanks to the CV folks for donating the gifts & thanks to the following Lions for making the deliveries: Lions Wayne DeFonzo, Ron Cashman, Chris Stank, Cathy Stank, Jim Miller, Ron Cashman, Lana McCaulley, Tim McCaulley, Terry Hartzell & Ted Cramer. From left , Lion Secretary Ted who sponsored new Lions: Ron Cashman, Tawnya Kling, Bob Dipple, and PDG Fred Lamason presenting. For more photos of our 2017-2018 Installation night and awards, click here: go to "Installation Nights" . Email this link to your supporters! POST this link on Facebook, Pinterest and your Website! We mail the booklets to your supporters FREE of charge. Your organization receives the same $5 for each booklet sold online! A check will be mailed to your organization for the total of your online sales at the end of the event. Your organization's online sales count is updated weekly on the Sales Reporting page! Visit the Online Selling link under My Tools on the Community Days website for more online selling ideas. 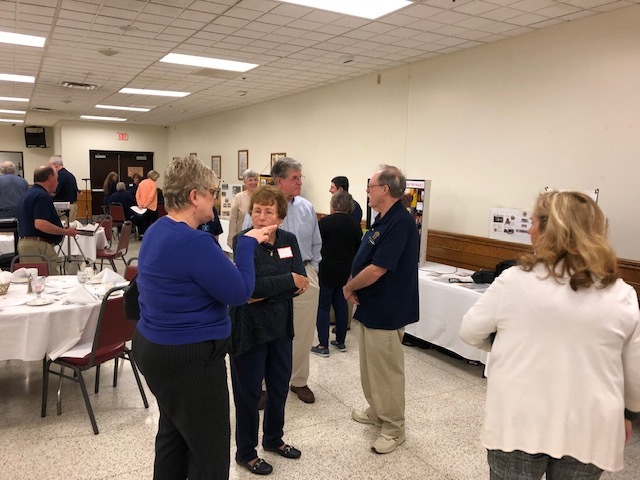 Our August 22nd meeting will be held at Brother’s Family Restaurant located at 705 Gettysburg Pike, Mechanicsburg 17055. Everyone can order from the menu & we will haveour own private room. This is a BYOB Event! A few photos from Friday's District 14C night at the Harrisburg Senators game. Eary bird Lion Chris Stank watched ABC morning news and saw our Pledge of Allegiance from a recent meeting. A lot of shiny heads are in the video too. Please click here to review it. 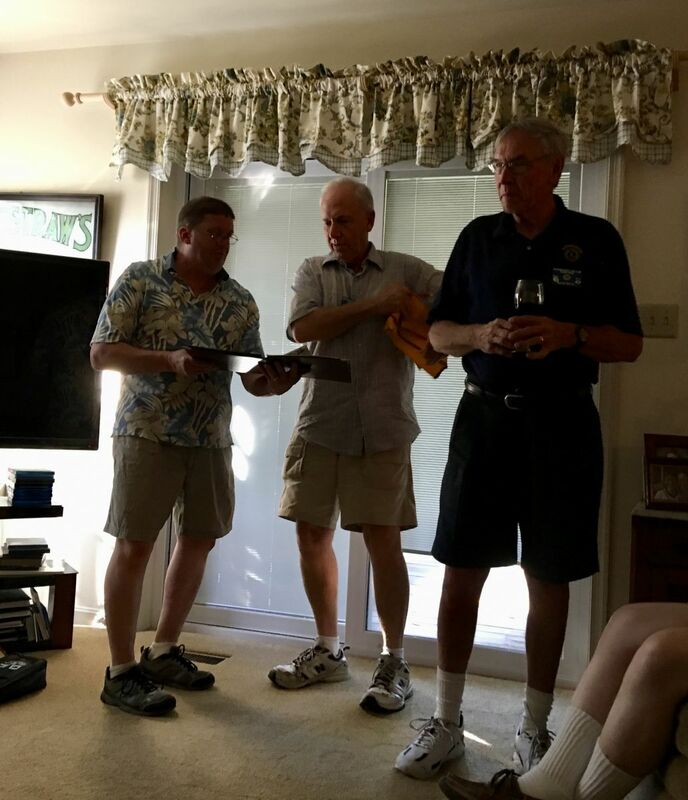 4 members of the Mechanicsburg Lions Club participated in the Silver Spring Twp Police Department's National Night Out on Tuesday, Aug 1. 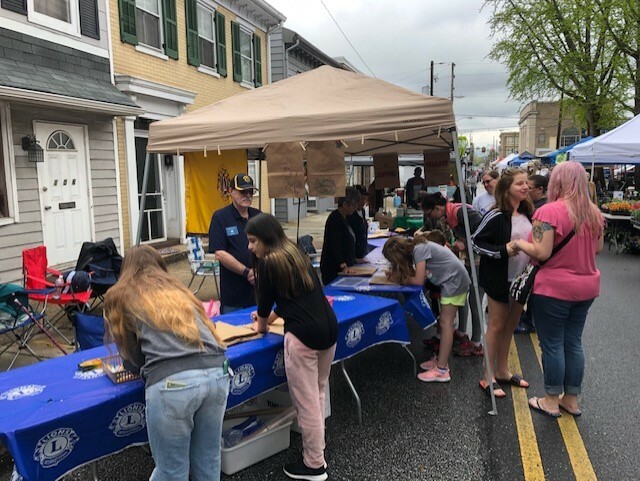 Our club had an information distribution table, we executed a raffle give away for the Silver Springs Police Department...giving away 25 "stuff your own" police dogs and fire fighter dogs., and we gave out FREE glasses cases. Thanks to Tawnya Kling for leading the club's participation. Also participating for our club were Lions Ted Cramer, CeCe Viti and Chris Stank. 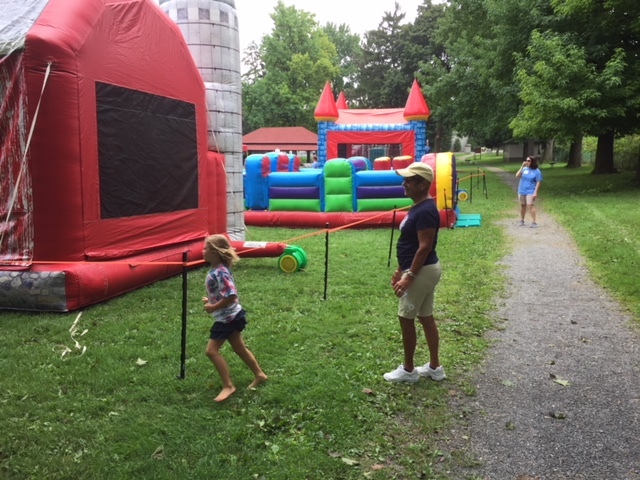 It was a great event with many families visiting the park. 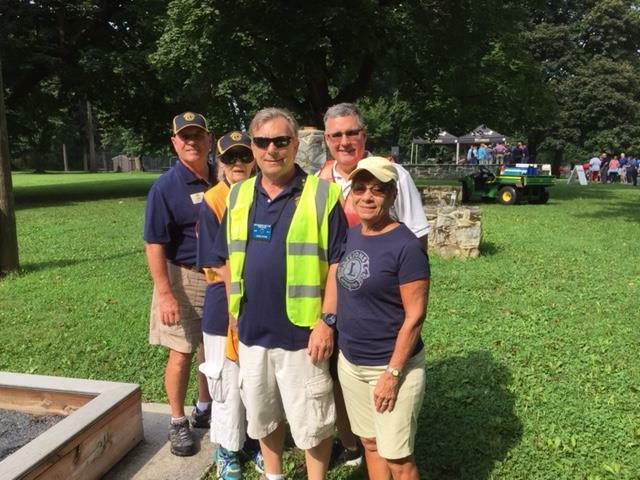 The Mechanicsburg Lions club had 7 members help at the annual TRI4KIDS event held at the Soldiers and Sailors field in Mechanicsburg. The event was for kids ages 5 to 12. They did swimming, bicycling and swimming. Our members were at guiding posts for various activities. Participating from our club were: Lions Tim, CeCe, Bob Smith, Lion Steve and his wife Danielle, Cathy and Chris. We had 8 club members attend the first "Zone Picnic". 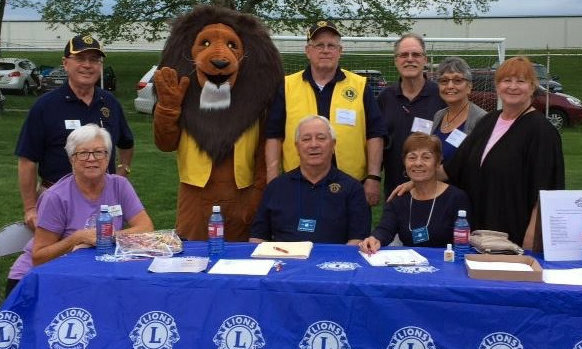 Held at Pinchot park, the Mechanicsburg Lions joined members of other Lions Club from our zone. This was the first such event and we plan to continue in future years. A very nice social event that was open to Lions and their families. 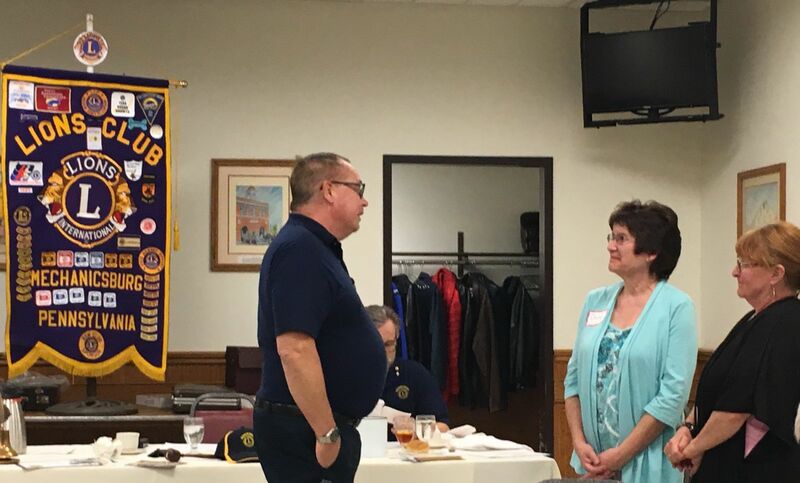 PDG Fred Lamason installs new member Bob Buhrig (center) with Sponsor Lion Lana McCaulley on right. 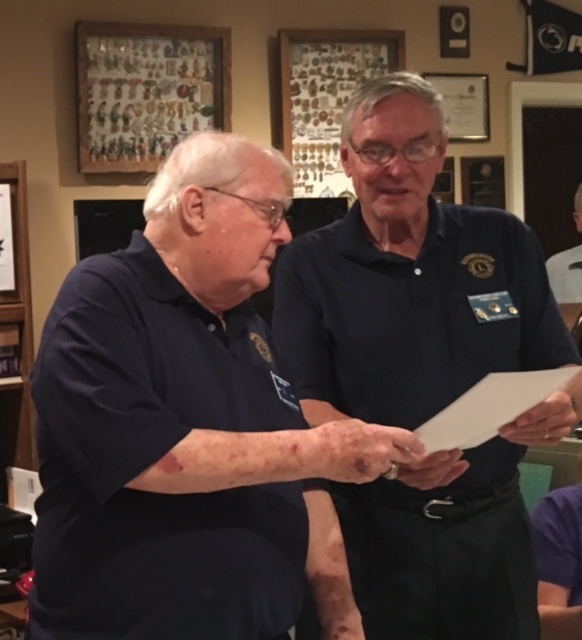 King Lion Jim presenting PDG Fred Lamason a certificate for his many years of service to our club. PDG Fred is relocating to Florida soon. Lion Treasurer Chis Stank hard at work taking King Lion Jim's dinner money! Lion Tim instructing cook Lion Bob Smith on the finer points of grilling steaks. Lady Lions kabutzing around the table! Lion Sue Miller, Lion Lana McCaulley (in back) Lion Cathy Stank and Lion Susan Holder. 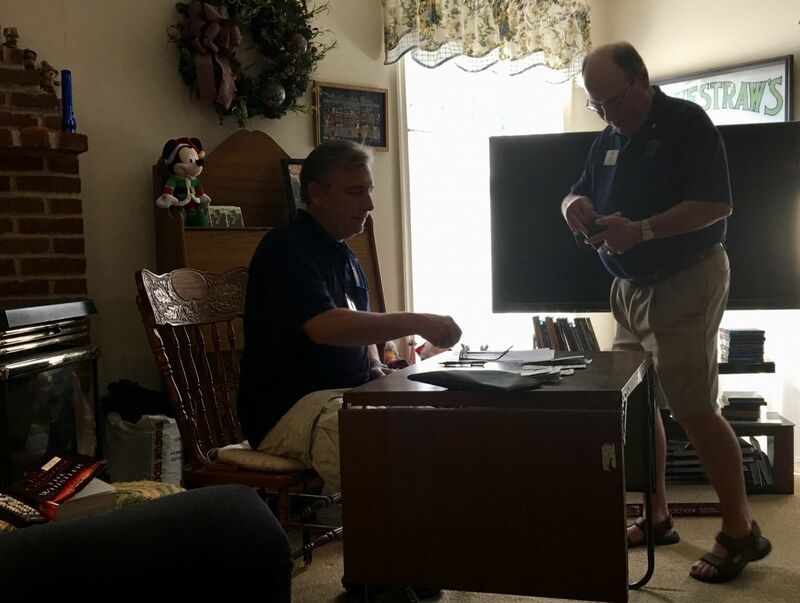 Lions Mike Fenicle, Charley Rixey and John Behel getting things together! A Big thank you to all of our faithful patrons, and to all the Lions who were able to help with the set-up, running, and tearing down at the end and especially to Myers-Buhrig Funeral Home for use of their facilities once again this year! Lion Mike and Lion Tim ! Our Mascot, Lion Foss greeting bingo players! Lion Mike and Lion Tim and with Lion Foss ( our mascot ) bringing people in to play bingo. Lion Keith Hoffman created the Facebook site and Lion Ted added some information regarding the Club's mission, address, etc. Lion Ted will be the only one able to edit the page. This is being done to promote our club's activities and attract new members. This is a work in process - we will make additions to the site as time permits. To access the site, just click on the link below. Be sure to "Like" it, then send invitations to your friends to "Like" it too. Happy browsing! Facebook Link below - Enjoy and please share! 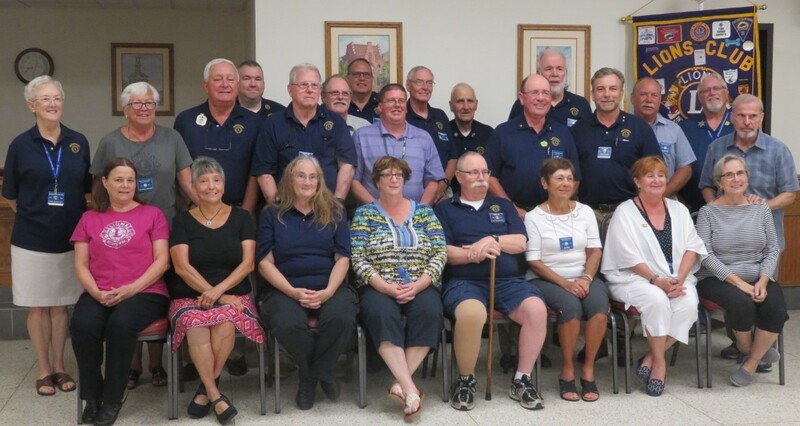 Mechanicsburg Lions Club was Chartered in 1949 and since then we have been giving continuous service to our local community and to Lions International. "One club, one family, one goal.....service!" "We Serve." Lions are part of a global service network, doing whatever is necessary to help our local communities. Please contact our membership chairperson our Secretary, Lion Ted Cramer at mechanicsburglionsclub@gmail.com for more information. Or, attend a scheduled meeting. We will be happy to have you. If you are still receiving our newsletter by snail mail and you have an e-mail address, please send Lion Ted youremail address and save the club the money for postage. We collect eyeglasses and hearing aids to be recycled for those in need. Where can I take my glasses and hearing aids to be recycled? Mechanicsburg Middle School 1750 S Market St, Mechanicsburg, PA 17055 ??? Upper Allen Elementary School 1790 S Market St, Mechanicsburg, PA 17055 ??? 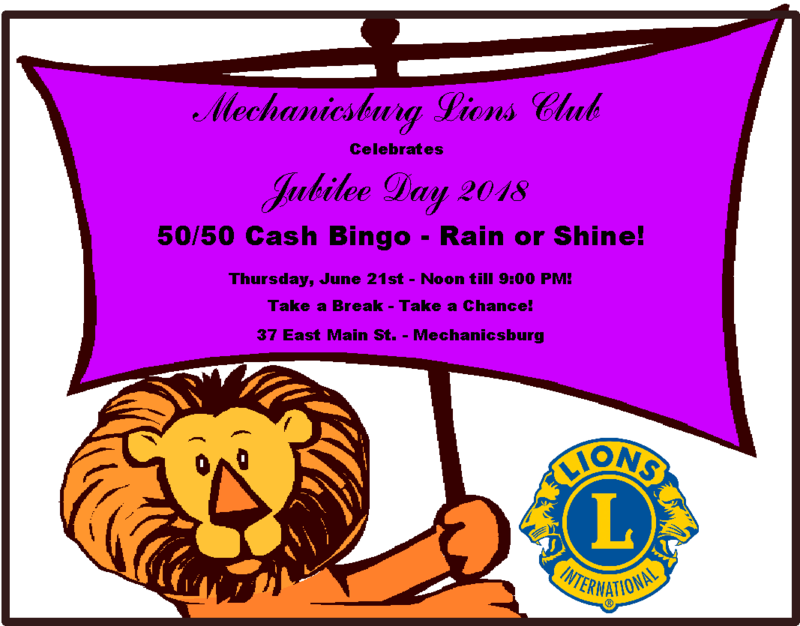 For more information or help with directions, please click here to e-mail Mechanicsburg Lions club.